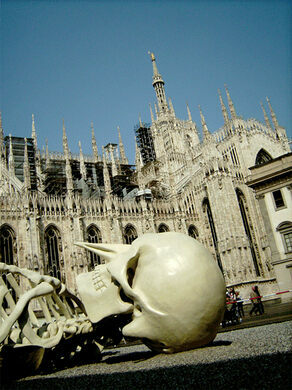 Created by Gino De Dominicis, this giant skeleton sculpture was displayed in Milan’s Palazzo Reale in 2007. Named “Calamita Cosmica,” or “Cosmic Magnet,” the sculpture is 28 meters long and weighs about eight tons, or 16,000 pounds. The artist completed this work shortly before his death. 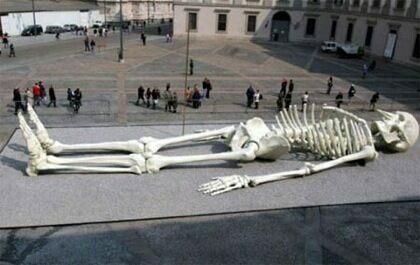 The piece is quite accurate looking — just much larger, obviously, than any standard human skeleton. 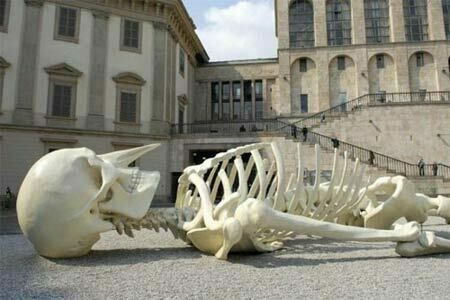 The only thing that isn’t accurate about the design is the skeleton’s long, pointy nose, which is a feature that can be seen in much of De Dominicis’ work. After many visitors were able to see the Calamita Cosmica in Milan, the sculpture went on tour around Europe and was seen in Versailles and in Rome’s Museo Nazionale della Arti dei XXI Secolo. Update February 2018: The statue can now be found in the recently renovated Chiesa della Santissima Trinità in Annunziata in Foligno, in the Umbria region.